Today I feel like rambling about a few things that have nothing to do with each other at all. Bear with me. First, the knitting stuff. My sock is progressing, I'm almost at the point where I start working on the intimidating heel. I've been very easily distracted lately, so I keep knitting a few rounds and then putting my sock down and wandering off. Is it possible to develop attention deficit disorder later in life? I swear, I used to have focus. This morning I placed my very first order at Knit Picks. Normally I buy yarn for specific projects, but today I decided to throw caution to the wind and just picked up a few different weights and colors with no thought to what they might become. They're having a sal e (for a few more hours, anyway), so I even got some alpaca blend. Alpaca became my favorite fiber (I think it's weird to have a favorite fiber; normal people do not have a favorite fiber.) after my trip to the Peruvian highlands--alpaca is everywhere and quite cheap. We visited a llama/alpaca farm and let me tell you, alpacas are damn cute, too. See? 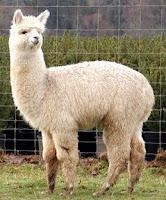 I have some animal-rights-related guilt about using alpaca (and all wool, actually, but that's another story), but I choose to assume the alpacas that provided the yarn I just ordered are treated humanely. Honestly, I could drive myself nuts worrying about the animal rights implications of every decision I make; I need to learn to pat myself on the back for being a vegetarian and remind myself that I simply can't fret over every animal on the planet. Now, some non-knitting stuff. First, the Orioles. Oh. My. God. I don't know what is going on with this team. We were just swept by the Nationals--they're barely a baseball team. Honestly, they could start pulling people out of the stands and handing them uniforms, and this team would be better. It's painful. And I don't know what's worse--the players or the staff. It's going to be such a long summer if things don't turn around. It's not that I need them to win all the time--clearly, if that were the case, I would've stopped being an Orioles fan a long time ago. But lately it seems like they're not even trying. In fact, sometimes it seems like they're going out of their way to lose. And that is frustrating. Wake up, dismayed to find that a miracle hasn't occurred overnight, and I'm still practically blind. Fumble around for contact lens case; accidentally knock it to the floor (if the cats haven't already); reach for white blob that I hope is said case. Remove lens, wash for the 3rd time, jam back into eye; blink repeatedly. Finally, lens feels bearable. Someday soon, my eyes will stop changing, and I will be able to get lasik. I can't wait.